Eve Warnock is a multi-media artist who incorporates new and old technologies in the art of storytelling. Her current project, SEEKAGO, is a series of five experimental films that utilize movement, costume, set design, sound, electronics, and projection to tell the story of two lovers journey. The films are titled Breathing, Asphalt, The Chicken and the Coyote, FEAST, and Flight. 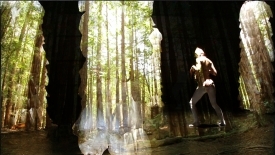 Each film works independently to remark on human, animal, and environment ecologies. Other projects include Speakers, a roving sound performance using etextiles. Denizen, a projection based street performance, Bagged, a sculptural set design, and Queen Mae and the Bells, a modern Opera Troupe. Eve was the art director for The Peer Gynt Project , directed by Kimberly Jannarone in association with the University of California Santa Cruz, fashion designer for AVEDA, Window designer for Victoria Secret, and producer of Homeslice, a stop motion animation. Currently, she is also developing a curriculum that teaches storytelling through design, character development, electronics, projection, movement, and sound. Visit http://www.zero1.org/events/event/warnock/ for more information.